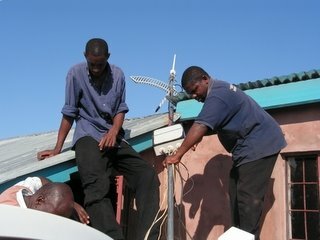 With support from everybody around, joseph and i managed to have the antenna standing at the base station, fadeco. It sure was had work. The antenna overall height is about 40feet high. We have 2 support wireless about 10 feet from the top to stop from continuous swaying during storms. We fixed the bridges in a water proof box & mounted it on the antenna mast too.